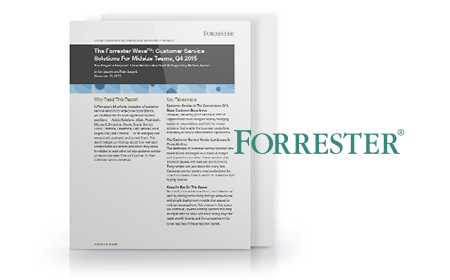 READ THE FORRESTER WAVE™: CUSTOMER SERVICE SOLUTIONS FOR MIDSIZE TEAMS, Q4 2015 TO LEARN MORE. Service Cloud can transform your company’s customer service. Fast setup and a high-performance console are just the beginning. Service Cloud helps you solve problems faster on any channel, radically increase agent productivity, give customers valuable always-on self-service options, and dramatically improve customer satisfaction. Find out why Service Cloud was cited as a leader among Customer Service Solutions for Midsize Teams. Download the Forrester report to learn more.